‘SHADOW’: The Most Beautiful Martial Arts Film EVER? Zhang Yimou’s Shadow is a sight to behold, and we would struggle to find another martial arts film where every shot looks like a postcard. If you re expecting something similar to his previous film The Great Wall , then you are in for a shock. You would almost swear this film was shot in black and white, were it not for muted color of the characters skin, which, after a little while seems strange to look at…almost as if you were expecting it to be grey…and let’s not even talk about the blood..you can see that one for yourselves. Deng Chao plays both Jing, a lowly commoner adopted by royalty when he was young, and also an ailing, high-ranking Commander Yu, whom Jing stands in for. As Jing, Deng suffers in silence, bound to duty but desperately missing a mother he hasn’t been allowed to visit since he was a child. He walks around in the Commander’s shoes while the real man in question hides behind a false wall deep inside his residence, a cave-like opening with little sunlight, becoming engulfed by anger and ambition. The look of Shadow is supposed to emulate black-and-white Chinese ink brush paintings. Every weapon, every ornament and every piece of fabric, almost everything in the entire film is black, white, or some shade of grey that binds the two together, so our eyes are always drawn to the characters faces. And yet, as the characters train and speak of spiritual balance, sometimes doing battle on Yin-and-yang symbols drawn across the floor, the rain and the mountains create a peaceful monochrome landscape whose balance is thrown off by human presence. 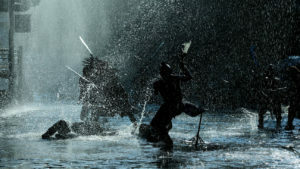 Shadow is very much an action film, although the action is, admittedly, as gorgeous and inventive as you’d expect from Zhang Yimou, but the action clashes wildly with the film’s own approach to military conflict. Taken out of the context of , the fight scenes are some of the very best you’re likely to find in 2018, with dozens of soldiers spinning through a town encased in metal umbrellas while firing crossbows. And yet, the film does its action sequences no favours by introducing political double-cross upon political double-cross at every turn, to the point that all action ceases to have meaning in the first place. Despite any small issues, the film is full of great performances, each working hard to making the film feel alive, given its lack of color. 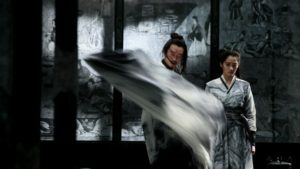 They succeed, as do the production and costume design as colourless contrast but in the process of highlighting the pointlessness of war, Zhang scales so far back to gaze at the big picture that he ceases to have a point at all, failing to tether us to his plot or story with anything resembling a point. Major military decisions taking place off-screen allows room for the interpersonal conflicts to breathe, but these conflicts aren’t sturdy enough to carry a film that, ultimately, relies on militarism for dramatic tension (and, quite simply, for entertainment), despite robbing the idea of wartime conflict of meaning altogether. Shadow tries to have its cake and eat it too, but at least it looks pretty doing it.